Most people will have 32 permanent adult teeth, but the jaw is often too small to successfully accommodate the last teeth to arrive – the third molars, or “wisdom teeth.” When these teeth are unable to erupt, they experience what is known as impaction. As a result, the teeth never reach the proper place for chewing, cleaning, and other crucial actions. Thankfully, Dr. Moreland can assist patients and their families with this potentially serious concern. Contact our St. Louis location to experience advanced assistance from a highly trained oral surgeon who has your best interests at heart. What are the Types of Tooth Impaction? Dr. Moreland will want to see a patient for a consultation to decide whether or not they’ll truly benefit from wisdom tooth removal. A three-dimensional X-ray of the mouth and jaws will be captured to determine the severity of the impaction, if there is room to allow natural eruption, and how difficult it will be to remove them from the jaw. 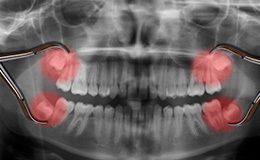 Soft Tissue Impaction – This occurs when there is not enough room available for proper cleanings along the gum tissue. Partial Bony Impaction – While there is enough space for the wisdom tooth or teeth to partially erupt, they won’t be able to function for chewing purposes and will also be difficult to clean. Complete Bony Impaction – There is NO available space for the tooth/teeth to erupt. They remain completely embedded in the jawbone, resulting in the need for advanced surgery. The teeth may also be in a strange position, or the jawbone and other facial structures may be strangely shaped, which adds an extra layer of complexity.